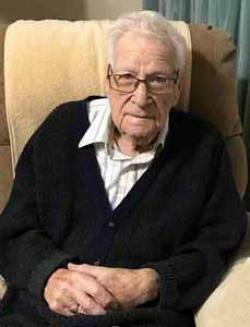 Everett P. Petley, 94, of Harcourt, passed away peacefully at the Stella Maris de Kent Hospital, Sainte-Anne-de-Kent, on Saturday, February 9, 2019. Born in Harcourt, he was the son of the late William and Bertha (Betts) Petley. Everett will be sadly missed by his granddaughter, Sherry; great grandchildren, Danny, Alexander and Quinton; sisters, Gloria Anderson of Bedford, NS and Donna Lockhart of Pasadena, CA, as well as several nieces, nephews and extended family members. In addition to his parents, he was predeceased by his wife, Kathleen "Kay" Petley (November 2018); son, Gary (1999); grandson, Troy; brothers, Earl, Carl, Carman and Laurie and sisters, Jessie and Roberta "Bertie". In keeping with Everett’s wishes, there will be no visitation hours or funeral service. Private family graveside service will be held in Harcourt Presbyterian Cemetery in the spring. Funeral arrangements entrusted to Fergusons Funeral Home, 1657 Mountain Road, Moncton (858-1995). In memory of Everett, donations to a memorial of the donor’s choice would be appreciated.